Here's our list of the best hunting dog breeds; is your four-legged hunting buddy on the list? We love dogs: we love them as pets, and we certainly love them as hunting partners. And while not all breeds can serve terribly well as hunting dogs--if you can't picture your chihuahua's prey drive adding too much to your hunting success, then you aren't alone--many different kinds of dogs can serve as wonderful hunting partners depending on what kind of game you're pursuing. There are plenty of hunters who are loyal to their breed, whether it's an English setter, a cocker spaniel, a Boykin spaniel, an English springer spaniel, a Brittany spaniel or one of the dogs on this list, each breed will produce great hunters. However, here are our top 10 favorite hunting dogs breeds. It's right there in the name. Most retriever breeds make wonderful water dogs, and the Labrador might just be the "ultimate" waterfowl dog. With bundles of energy, a cold-weather coat meant for long days outdoors and on big ranches, and the willingness to go to any lengths to retrieve your kill, the Labrador retriever is best for duck hunting, but can help you out with any type of small game. Just make sure your hungry lab doesn't eat the bird for him or herself. These dogs were bred with the purpose of hunting foxes, and are still very much up to that task. Deer hunters have also adopted their running skills to fall deer season, but American foxhound are a great hunting breed because they will pretty much chase down anything you tell them to. Perhaps seen as the "iconic" hunting dog, the Beagle is much like the American foxhound in its persistence, energy, and love of the chase. 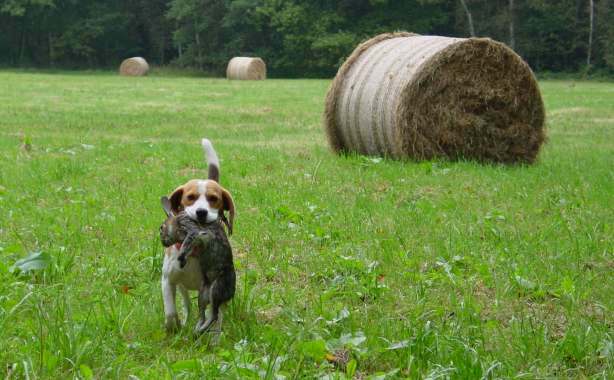 Its short legs handicap it somewhat in the pursuit of bigger game, but if you're hunting varmint like rabbits, the beagle is your dog. The pointer's thin coat disqualifies it a bit from effective big game hunting in the snowy north, but in the southern United States, where temperatures stay hot, the pointer is the perfect companion for finding and bagging birds in an expansive field. There are a number of pointers, though, including German shorthaired pointers, German wirehaired pointers and English pointers. These are some of the more iconic bird dogs on this list. Their very name makes them sound like ruthless hunters, and Bloodhounds live up to that expectation with their strong noses and unparalleled tracking abilities making them great hunting dogs. Often considered the quintessential "family dog," golden retrievers, like their Labrador cousins, are also wonderful small-game hunters. These dogs are perfect as a household breed for the kids which also doubles as a hunting partner for the parents. Like its retriever brethren, this dog, bred for duck hunting on the shores of its namesake Chesapeake Bay, is an energetic, intelligent, water-loving dog with the endurance to happily charge through a long day of hunting. 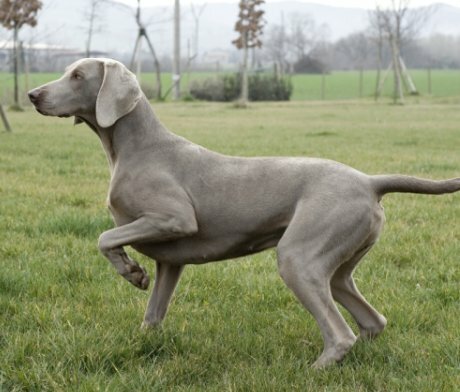 Unique and elegant looking, with long legs that may make them look awkward at first glance, Weimaraner dogs are fast and calm, perfect for hunting pheasant, quail or other birds. Got a raccoon problem? These sharp-nosed hunters will root out their namesake pests and help you bag them for good. If you are looking for a hunting dog that will go with you through all conditions and terrain types, this might be the companion for you. 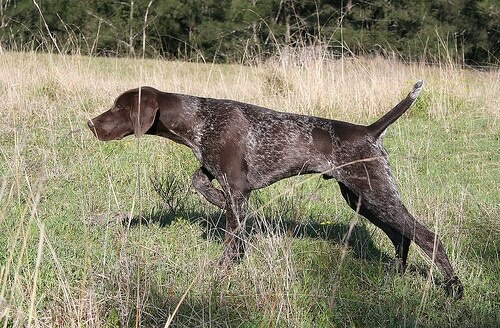 If Pointers are the perfect dog for hunting quail in the south, then Irish setters are ideal for fall turkey hunting.